The Adept Direct Cable Clip is an inexpensive, lightweight magnetic bracket for hanging power leads and cables. 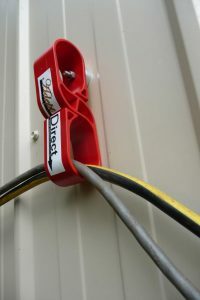 These innovative cable clips are very easy to use as they are magnetic and can quickly attach to all steel surfaces including steel garages, sheds, Colourbond fencing, purlins, steel columns, galvanised framing, steel bed frames etc. Adept Magnetic Cable Clips have used for a huge variety of applications: From attaching water hoses on an excavator to reduce dust through to securing cables and power leads on hospital beds! The plastic cable clip is non-conductive and is simply opened to allow 2 or 3 power leads or welding cables to be secured. The plastic clip then springs back to ensure the cables do not lift out even if flicked or pulled. The key reason magnetic cable hangers and clips are so effective in securing leads and cables in workshops and on building sites, lies in the fact that they are so simple to clip into position and use! Change the area where you’re using power tools or electrical appliances and the magnetic hangers can be quickly detached and moved. Magnetic Cable Clips require no tools and will adhere to any steel facade or metal surface. Need a Magnetic Cable Hanger that will hold much heavier cable or leads, up to 25 kg? Try the Adept Heavy Duty Magnetic Cable Hanger? Hospital Bed Power Lead Holder.